Way-coolness. I like it, as it does most-definitely have a very Klingon feel to it, with the sharp and pointed lines. Almost like blades in space, eh. I like the revamp as well, if not more actually, due to its higher level of detailing. I like the revamp a lot, too! I didn’t care much for the broken bow version but too was much happier with the Bounty re vamp! More great stuff my friend! 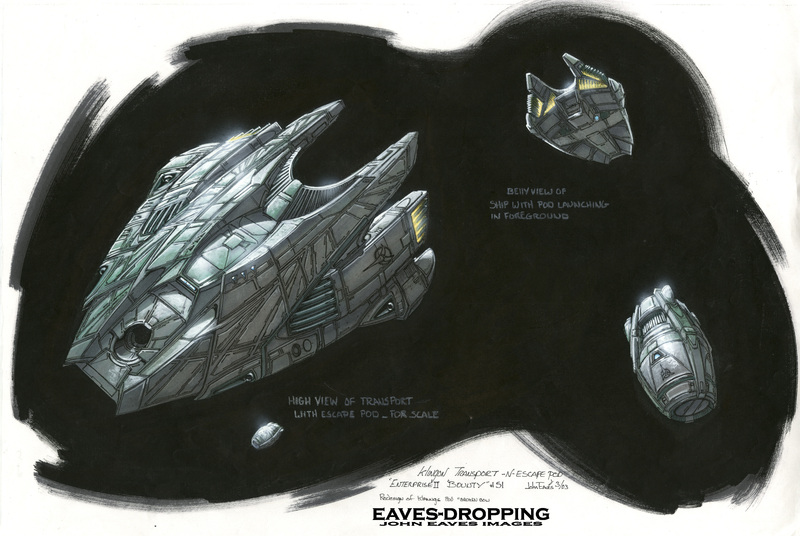 I really liked that Klingon Transport design – its way outside the typical Klingon design paradigm but still very recognizably Klingon. Nice work! Hmm, I’m not sure… but I think Bernd and Jorg have a list. 😉 Yeah, it definitely takes our interest when there’s an unidentifiable blob in the background and it’s great to find out there’s a fully designed ship behind it. Btw, the first drawing isn’t the original copy, is it? I hope the producers were only doodling over a photocopy? I’m still liking the fun little design you posted yesterday best…wee! Nice work with the photoshop on Miss Amanda’s dress!!! I’ll use you from now on instead of buying different color pin up outfits!!! and thanks, I liked that ship a lot too! The final design is cool, but I’m in love with the “Pass 3” design at the top. It just looks so badass, and adding the lil’ klingon guy checking under the hood is genius! HEY THANKS!!! If I have time I’ll color #3 for ya!!! That would be beyond amazing! Thank you! Many years later, the mystery of that ship from the pilot is solved! HAAA! What other mysteries do want to know about????? Yeah, I just pulled out my Season 1 Disc 1 DVD and there’s a quick camera pass over the corn stalks and you see the shuttle very briefly but it’s partially obscured by cornstalks. Too bad they didn’t go with the original idea, that sounds better. But it was also probably longer and more expensive and they had to make cuts. And I’ve always liked the ship from Bounty. It’s an unusual design and I like unusual designs. 🙂 It’s really cool that they modified the shuttle for use in that episode, since it was seen so fleetingly in Broken Bow. yeah it was fun to rework it a bit! Thanks for the images, John, and for continuing to lift the lid on some of the more obscure vessels from Enterprise. Funnily enough I kind of prefer the original shuttle to the revamp, looks a bit more angular (thought the curves on the transport seemed slightly un-Klingon, though can’t put my finger on why – after all Batleths are curved, as is the Klingon trefoil, and the cowling near the rear is similar to the one on the early Bird of Prey). 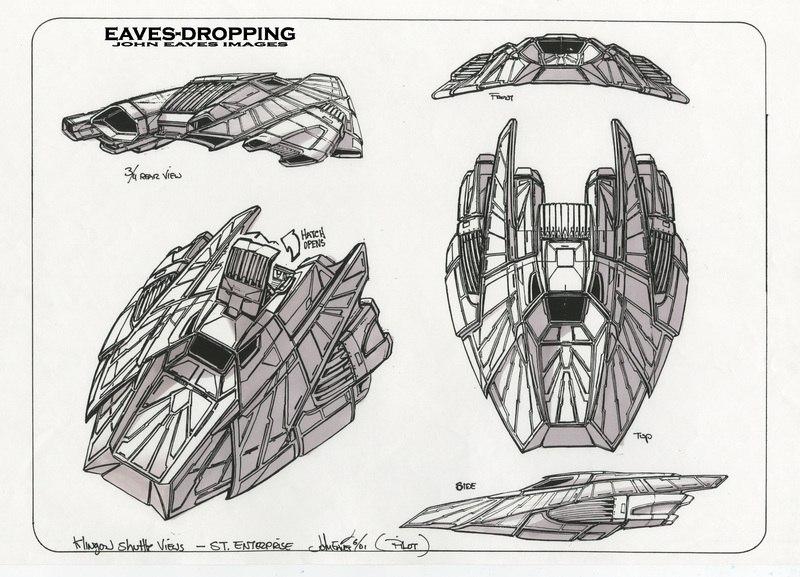 Speaking of obscure Enterprise vessels, have you come across any sketches or images of the mysterious Sarajevo, from Storm Front Part 2 and Daedalus, in your archives? Hey, Mark’s right–that’s another interesting little-seen ship: the Sarajevo. 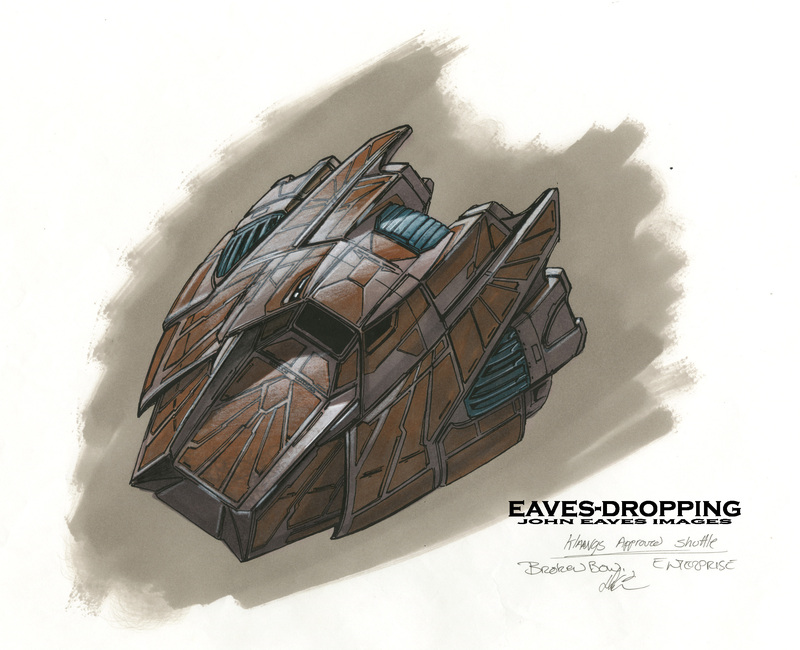 Probably the most unusual of all the Earth Starfleet ships that appeared. It really scream Klingon. would have love to see the oringal idea for the openning of Broken bow. I for one would like to see the broken bow shuttle-cgi, any chance? Man! How did I miss this yesterday?? Wow. I should have anticipated that after seeing yesterday’s shuttle sketches. 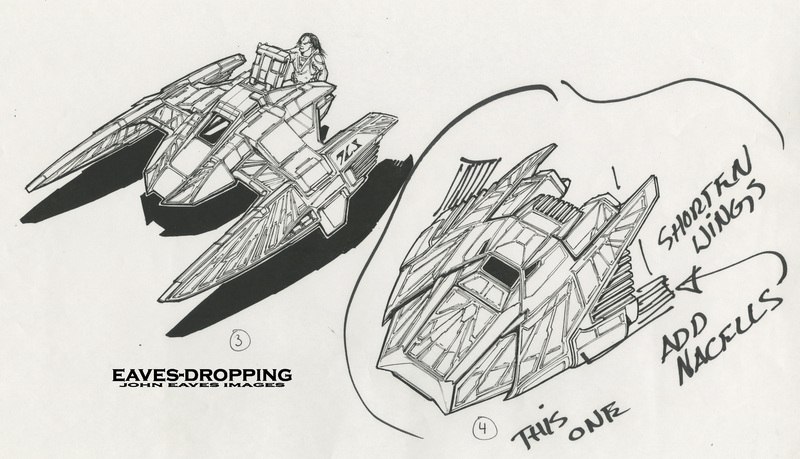 The ship from “Bounty” always appeared to be quite un-Klingon to me. But as a Klingon shuttle the general shape makes a lot of sense. Too bad it was visible only as a plume of smoke in “Broken Bow”.